To put it mildly, our freezer is rather chock-a-block. To the point where something inevitably comes cascading out whenever you open it, which is mildly annoying when all you want are a couple of ice-cubes for your G&T. I mean, uhm, water. Several weeks ago, I decided to start playing “freezer roulette” – open the freezer, and use up whatever comes tumbling out (as long as it belongs to me – actually nobody quite remembers precisely what belongs to whom, which is a whole other issue, so the game also requires some detective work). After several bananas came shooting out at me a few weekends ago, I decided that banana & walnut muffins were on the cards for breakfast. I enthusiastically set about whipping them up, not thinking about what I was going to do with a dozen muffins – I obviously wasn’t going to be eating them all by myself, even spread over two breakfasts. Excellent planning, right there. Since it was a Saturday, my usual tactic of taking surplus baking into the lab wasn’t going to work, so banana & walnut muffins were forced upon kindly offered to anybody who had the misfortune of stopping by the house that weekend. 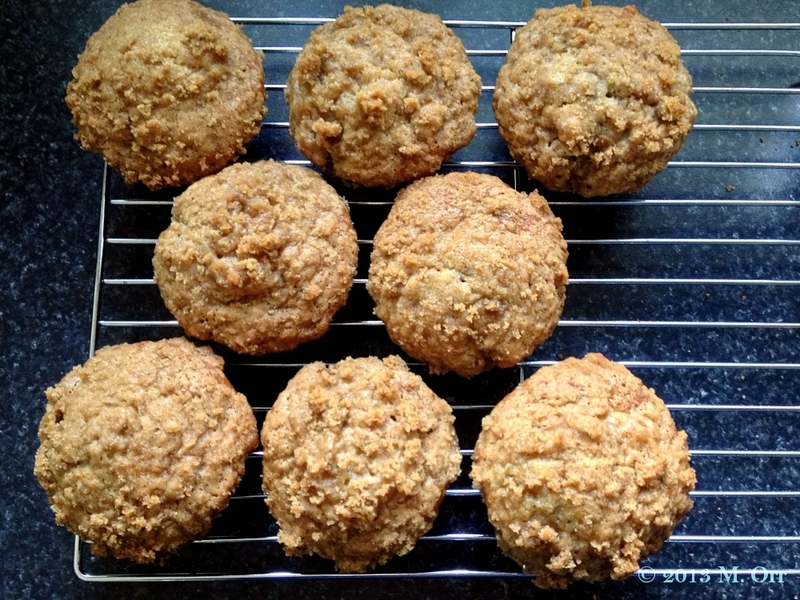 Luckily, the muffins turned out rather scrumptious – filling without being heavy, full of banana and walnut flavour and with a lovely slight crunch on top (although this softens up if left overnight). 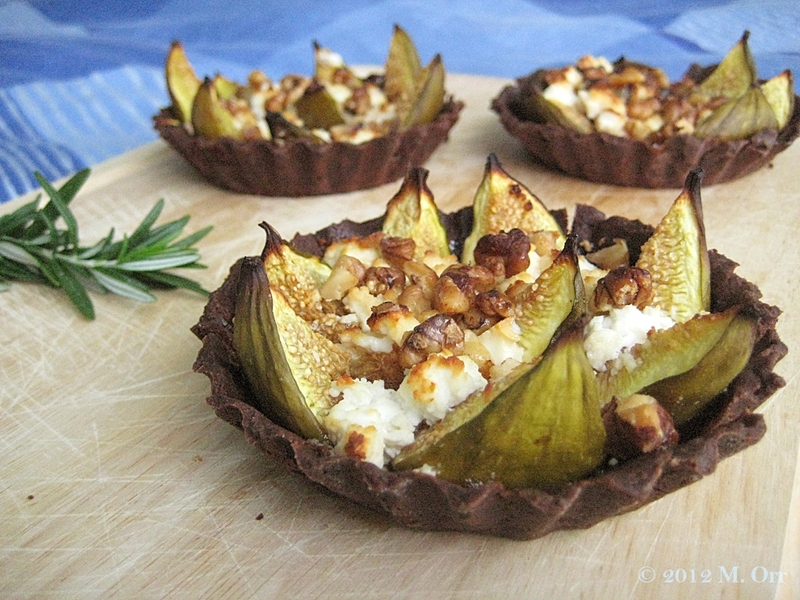 I’d wanted to add extra walnuts to the topping but ran out, so that would add a further delicious crunch. 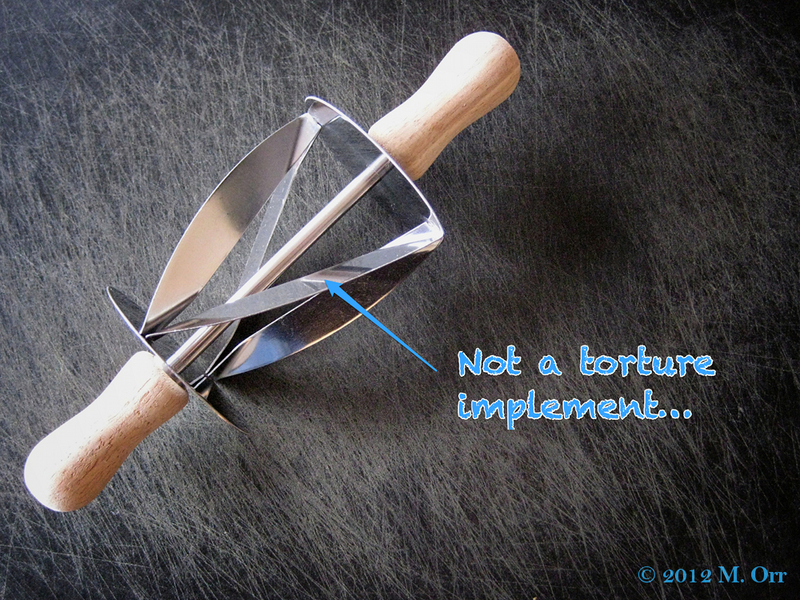 Nobody complained about being effectively force-fed muffins. And they make a fabulous breakfast by the way, especially since they don’t take too long to throw together. 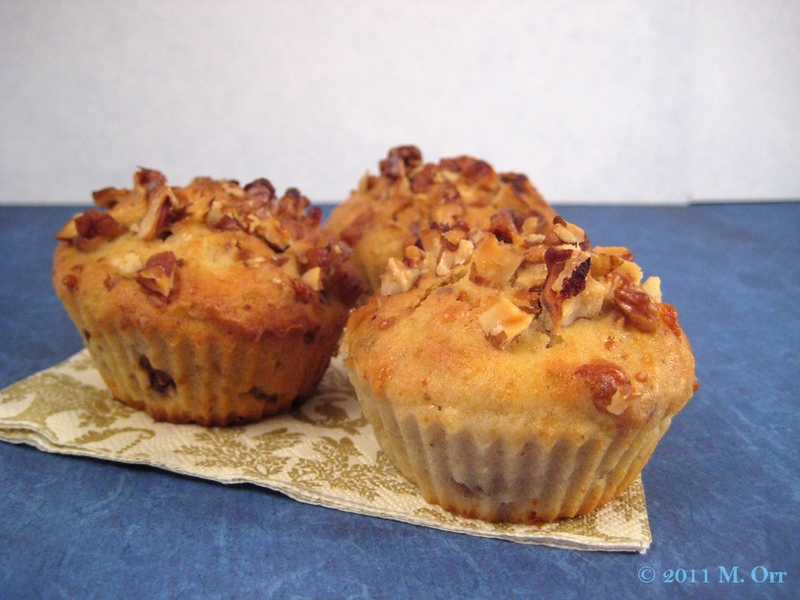 These make great breakfast muffins as they’re easy to throw together. If you’re using frozen bananas, remember to take them out far enough in advance to defrost (you can leave them out overnight if making these for breakfast). Toasting the walnuts is optional, but I find it really does enhance the flavour and really doesn’t take long. If you’re a big walnut fan, feel free to add some to the topping as well (I would have, but I’d run out). Muffins are best eaten the same day, but they will keep for a couple of days in an airtight container – the topping will just go a bit soft. 1. Roughly chop the walnuts halves or pieces and toast in a frying pan until fragrant (watch they don’t burn). Set aside to cool whilst preparing the muffins. 2. Line a muffin tin with liners or set out 12 silicone muffin moulds on a baking tray. Preheat the oven to 210°C/fan 190°C. 3. Sift the flour, baking powder, bicarbonate of soda, cinnamon and salt into a large bowl and stir together. 4. 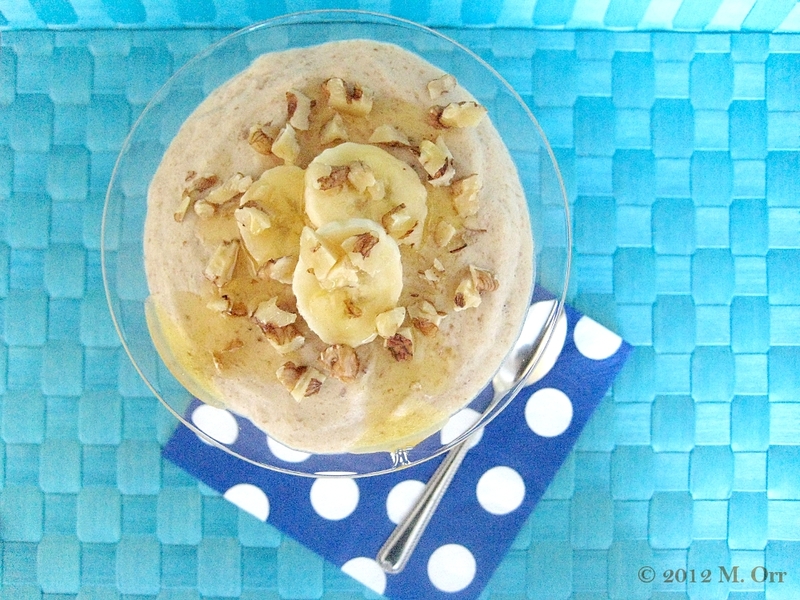 In a medium-sized bowl, mash the bananas with a fork. 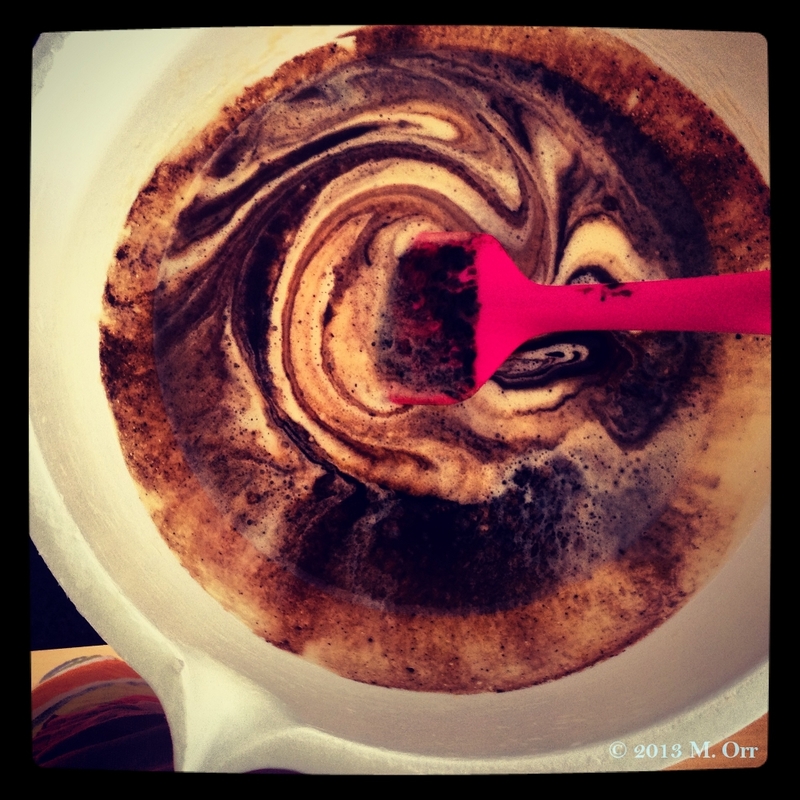 Add the sugars, egg, oil and vanilla extract and whisk together (either by hand or by electric whisk). 5. Fold the banana mixture into the flour mixture using a metal spoon until just combined (there should still be a few small streaks of flour in the mixture). Fold in the toasted walnuts and spoon the batter into the prepared muffin tin or moulds, not filling them more than ¾ full. 6. In a small bowl, stir together the sugar, flour and cinnamon. Rub in the butter, until crumbly in texture. Sprinkle over the tops of the muffins. 7. 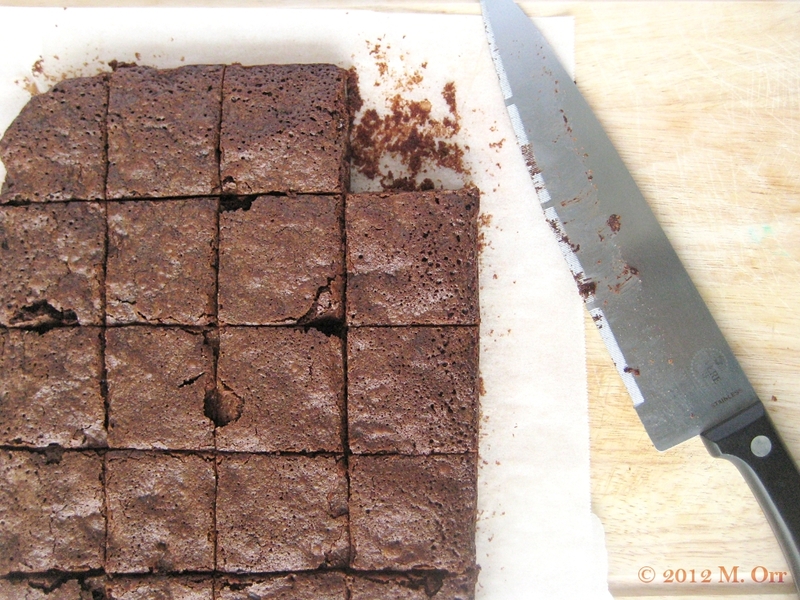 Bake for 18-20 mins, until risen and a toothpick inserted in the centre comes out clean. 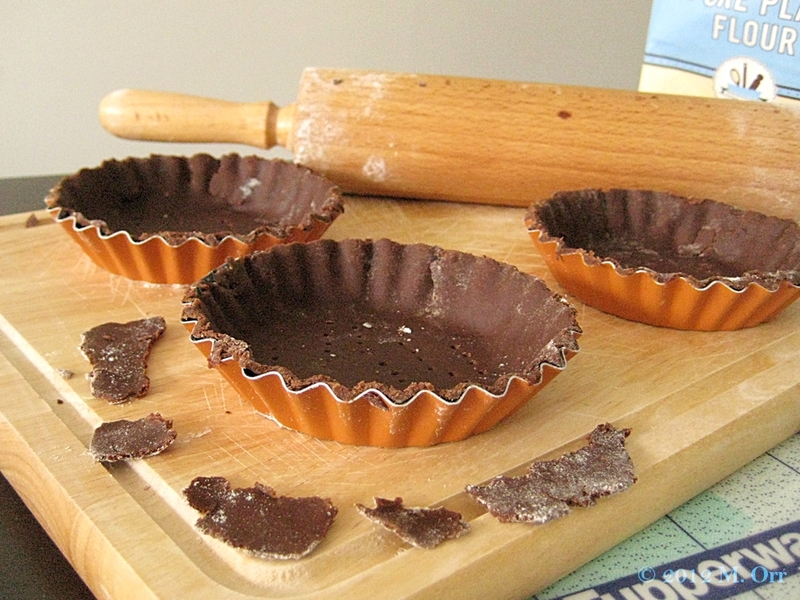 Either eat them warm or remove from the tin/moulds to a wire rack to cool. 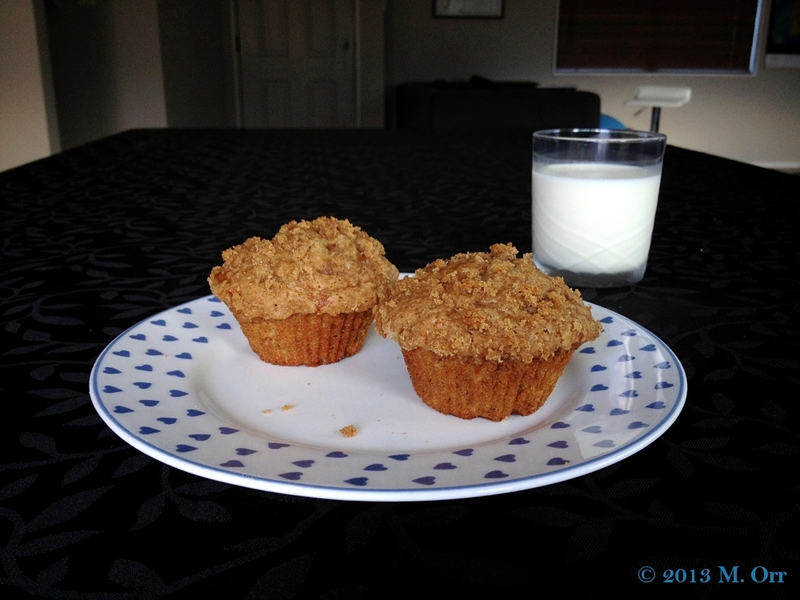 Since these muffins are made from scratch, I’m submitting them to this week’s Made with Love Mondays hosted by Javelin Warrior. One of the guiding principles is to avoid using frozen produce when you can use fresh, and whilst I did use frozen bananas, this recipe works perfectly whether using fresh or frozen bananas, so I’m sure that’ll be acceptable. Plus the bananas only ended up in the freezer because we had a deluge of overripe fresh bananas in the first place. 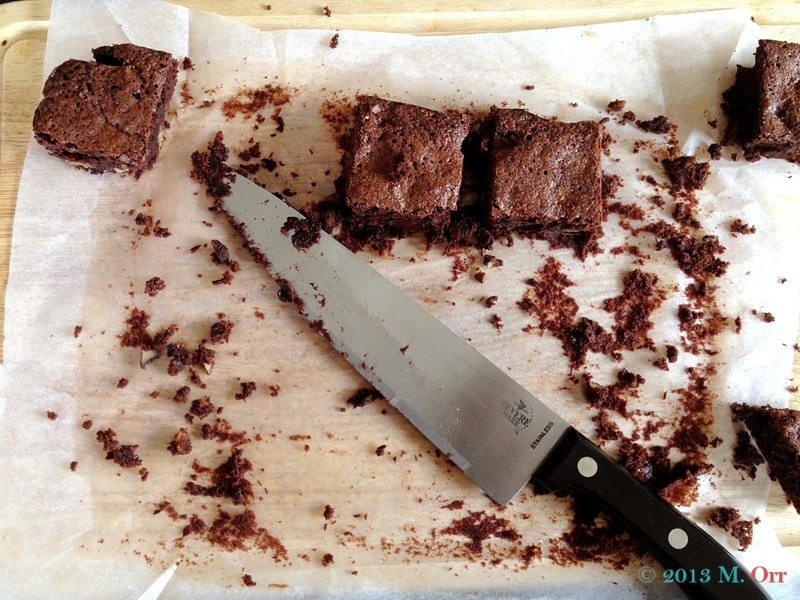 The letter for this month’s AlphaBakes , which is being hosted by Caroline Makes, is “D.” The deadline was yesterday. This post should have gone up yesterday, so I’m going to (attempt to) keep it short, and hope that I’ll be able to sneak it in under the radar. 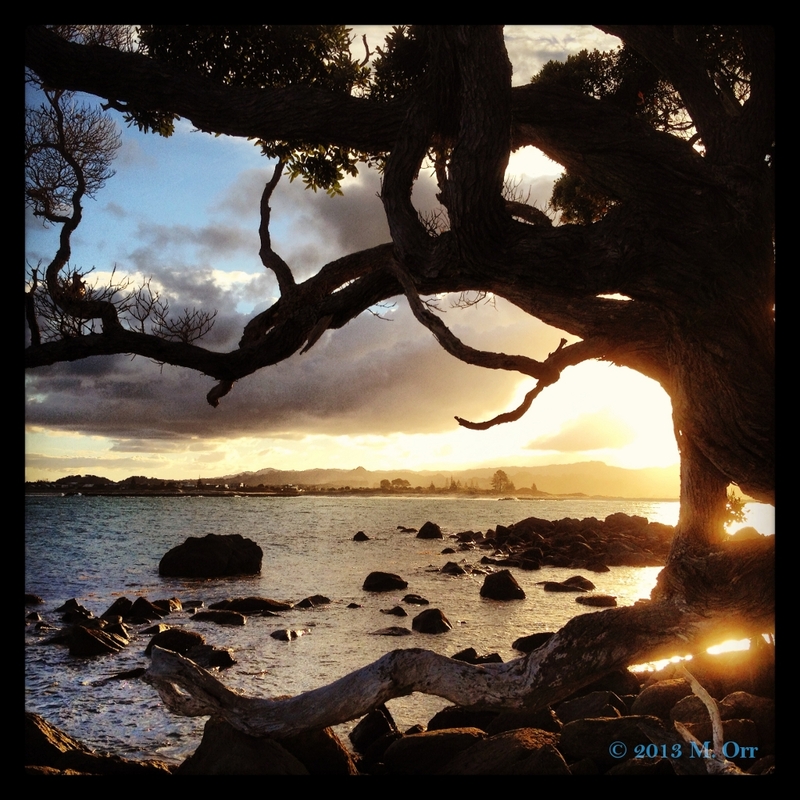 Things like actual uni work and snorkelling and sitting out on the deck in the sun keep getting in the way of blogging (read: I’m doing phenomenally well in the organisational department at the moment). It’s a hard life up in Leigh, obviously. However, I didn’t think that surpassing my daily requirement of vitamin D would quite count as a valid entry for the challenge. Sorry if you all hate me right now, particularly those of you shivering up in the northern hemisphere – I’d send you some sunshine if I could! 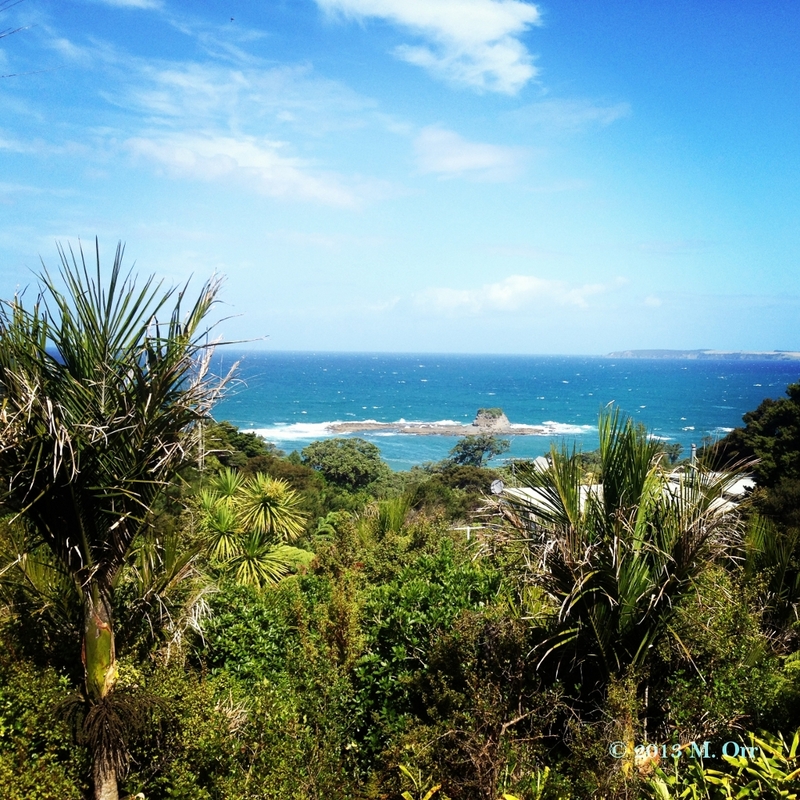 That’s the view I’m looking at from our deck as I write – I told you it was tough up here. 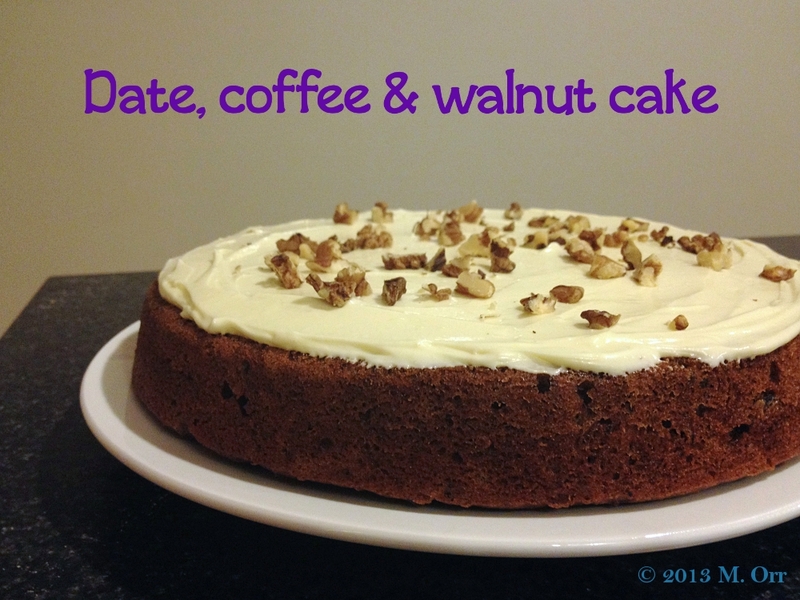 But anyway, before you all leave in a huff, back to the challenge: something food-related starting with D… I decided to go for dates, more specifically a date, coffee and walnut cake that I could share with my new housemates. 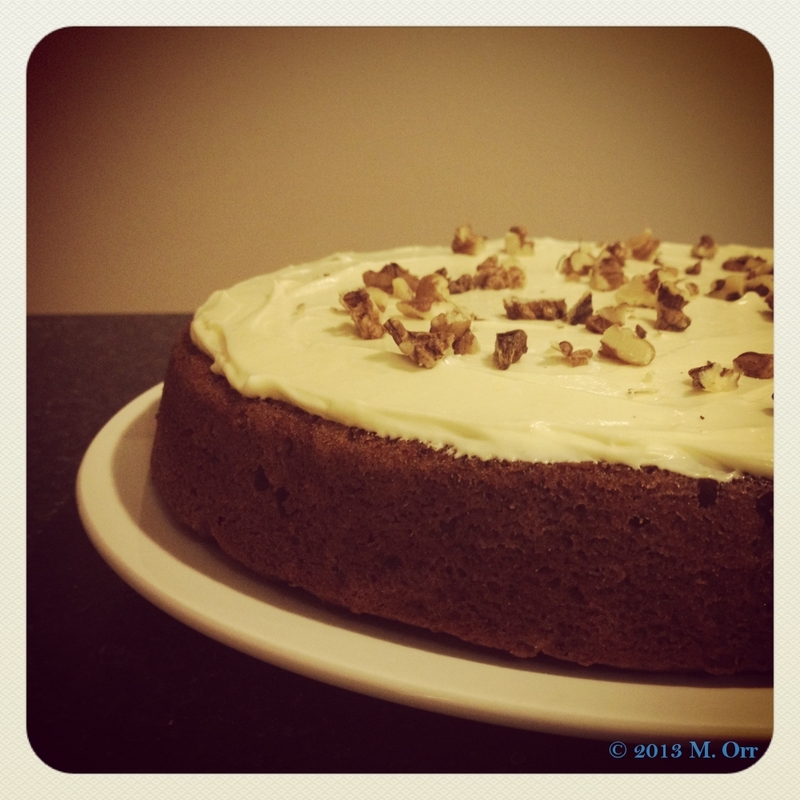 I probably should have checked whether anybody disliked any of the ingredients before I made the cake, because it turned out that one my housemates isn’t the hugest fan of dates, coffee or walnuts… Thankfully she loved the cake though (as did everybody else) and even asked for the recipe. Phew. 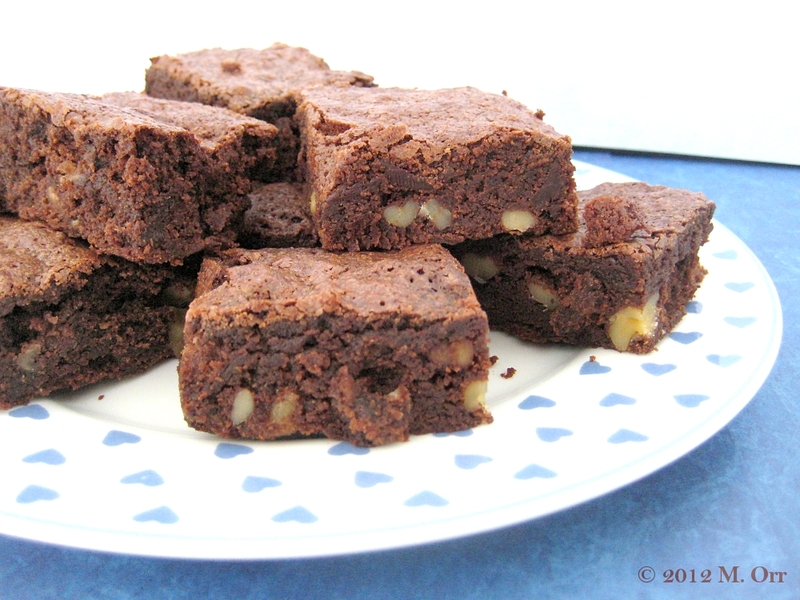 The cake itself is wonderfully moist, with a tiny bit of caramelised stickiness that comes courtesy of the dates. The coffee comes through as a subtle flavour (which is great since none of my housemates are really coffee-drinkers), with the walnuts adding a bit of crunch. Topping the whole cake off with cream cheese icing just makes it even more scrumptious. Though, let’s be honest, when is cream cheese icing ever not a good idea? Apologies for the photo quality by the way – the photos were snapped pretty quickly since we were all more interested in actually eating the cake. 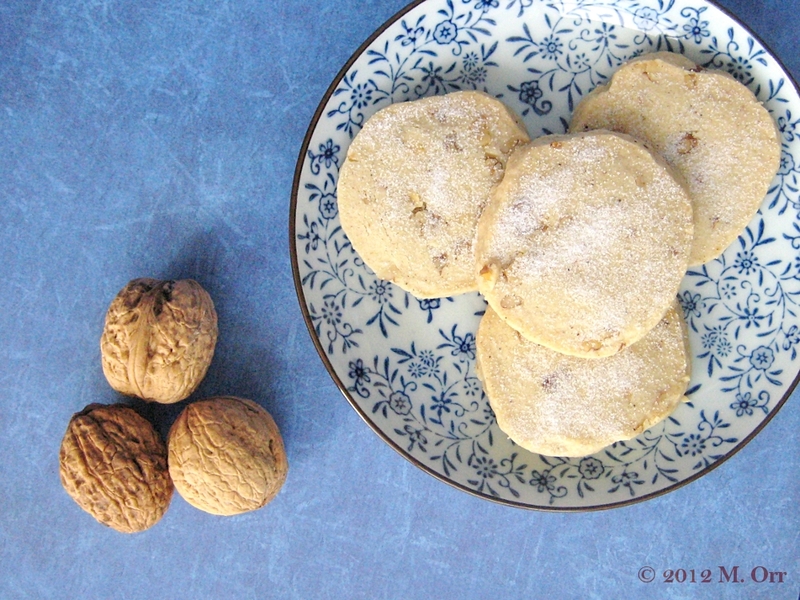 The walnuts don’t have to be toasted, but it’s highly recommended as it does heighten their flavour. The cake does come out very moist and a little sticky, and I found that it stuck to the serving plate a little which wasn’t ideal, but that may also have been because I didn’t let it cool fully before turning the cake out. The cake will keep for a couple of days, covered in the fridge, and in fact may even be better the next day, although do let it come to room temperature before serving. 1. Roughly chop the dates and add to a heatproof bowl. Brew the coffee and pour over the dates, to cover them. Set aside to cool. Add the walnuts to a small frying pan and toast them until fragrant. Set aside to cool, then roughly chop them. 2. Once the coffee and dates have cooled, line a 24cm round cake tin with baking paper. Pre-heat the oven to 170°C/fan oven 150°C. 3. In a large bowl, cream together the butter and sugar with an electric whisk, until light and fluffy. In a small bowl, lightly beat the eggs together, then whisk into the butter and sugar a little at a time, followed by 2 tbsp of the flour. 4. Sift the remaining flour, baking powder, spices and salt into a medium bowl and stir together. Add half of this mixture to the butter mixture and whisk together. 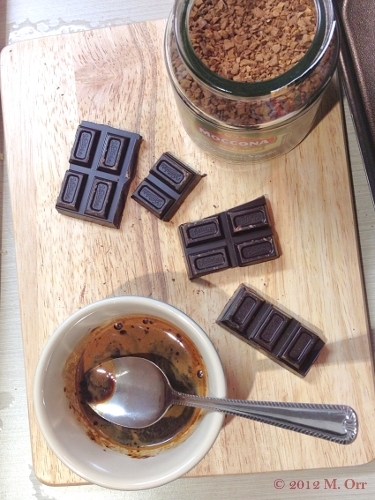 With a spatula or wooden spoon, fold in the dates, coffee and vanilla extract. 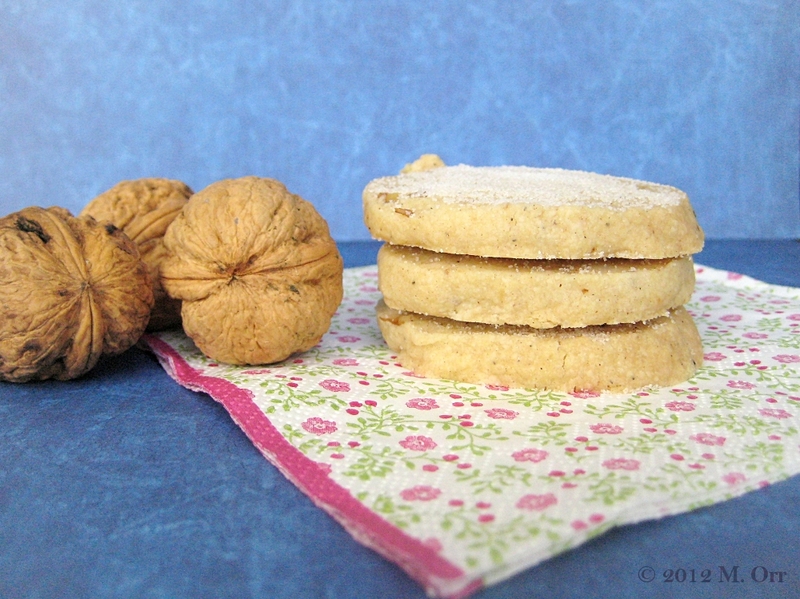 Once incorporated, fold in the remaining flour mixture, followed by 50g of the walnuts. 5. In a small ramekin, dissolve the bicarbonate of soda in 2 tbsp of hot water, then stir into the cake mixture before spooning into the prepared cake tin. 6. Bake for 50-55 minutes until a toothpick comes out clean. 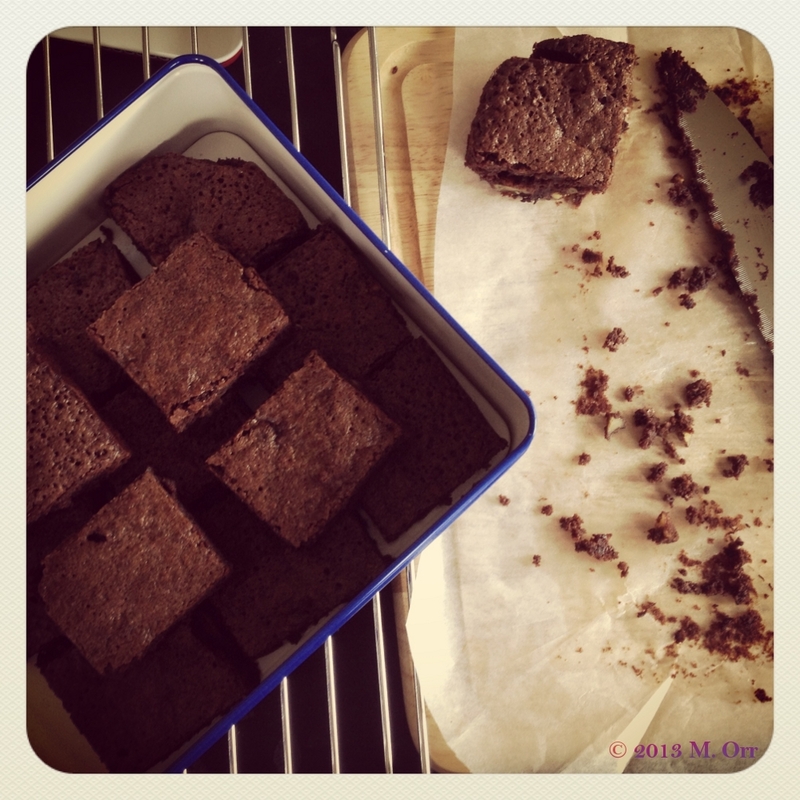 Allow to cool completely into the tin before turning out onto a serving plate to ice. 7. Once the cake is fully cooled, sift the icing sugar into a large bowl. Add the butter, cream cheese, lemon zest and vanilla extract and whisk until smooth. 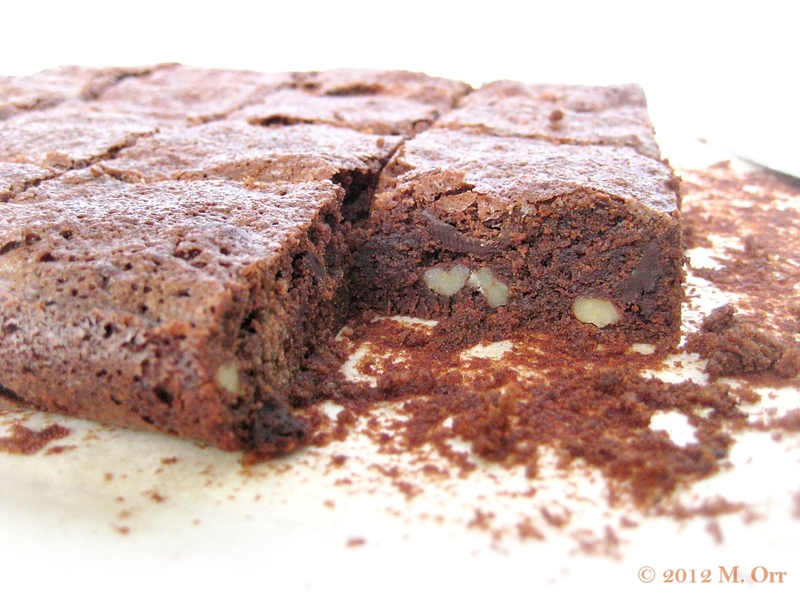 Spread over the cake and sprinkle with the remaining walnuts. Pretty funky, right? 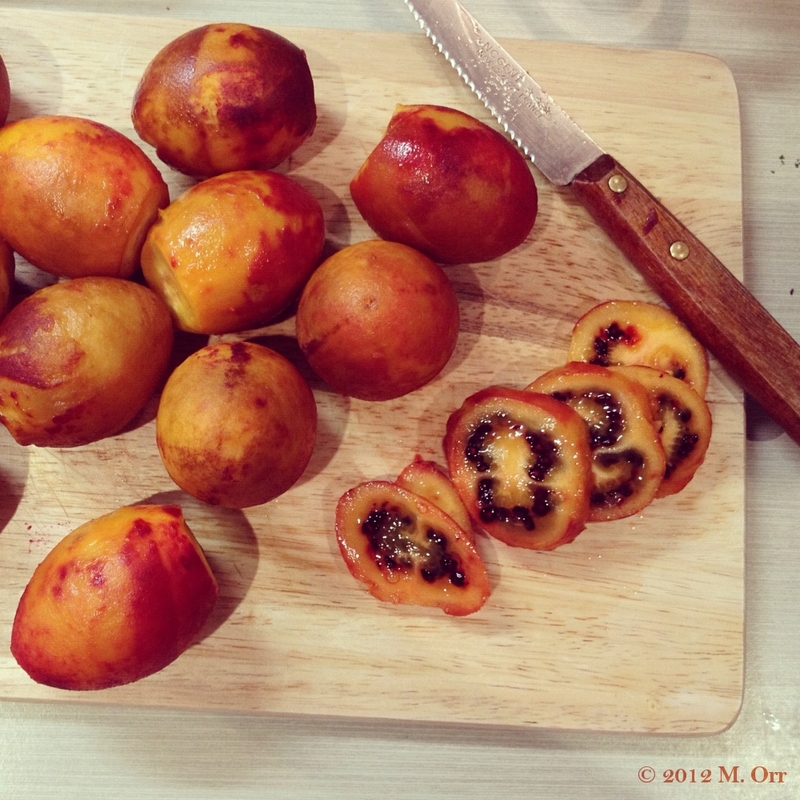 I first tried a tamarillo when one of my labmates brought a bag in from her garden several weeks ago. Which is good because I wouldn’t really have known how to eat them or what to do with them otherwise. They’re fairly bitter, so apparently they’re often poached in a sugar syrup before eating or very commonly used in chutneys. 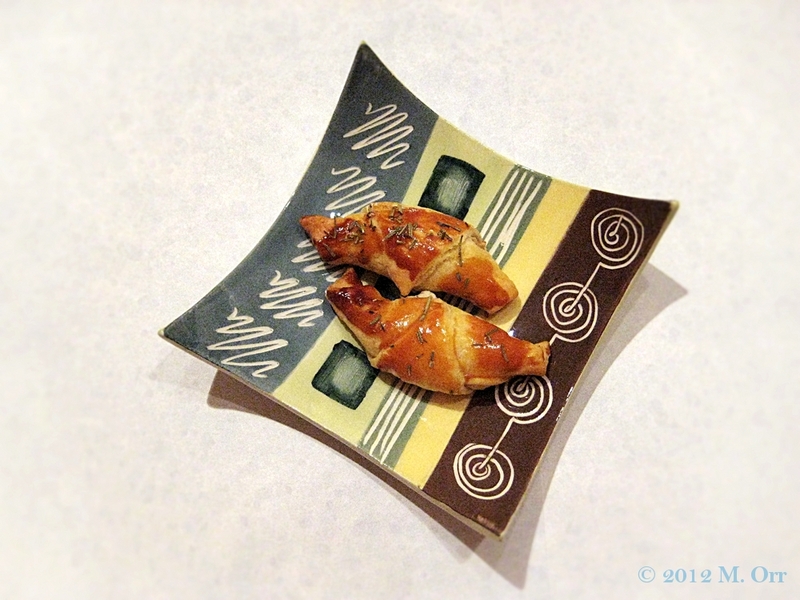 That said, they are edible fresh, too, but I think that comes down to a matter of taste. However you choose to eat them though, make sure to remove the skin because apparently it’s foul (I took everybody’s word for it). Just cut them in half and scoop out the flesh with a spoon if eating fresh (the seeds are fine to eat). Back when it was feijoa season, I borrowed several NZ baking books from the library since I didn’t really know what exactly to do with them. Conveniently, said books also contained tamarillo recipes which, in a moment of foresight, I also noted down. 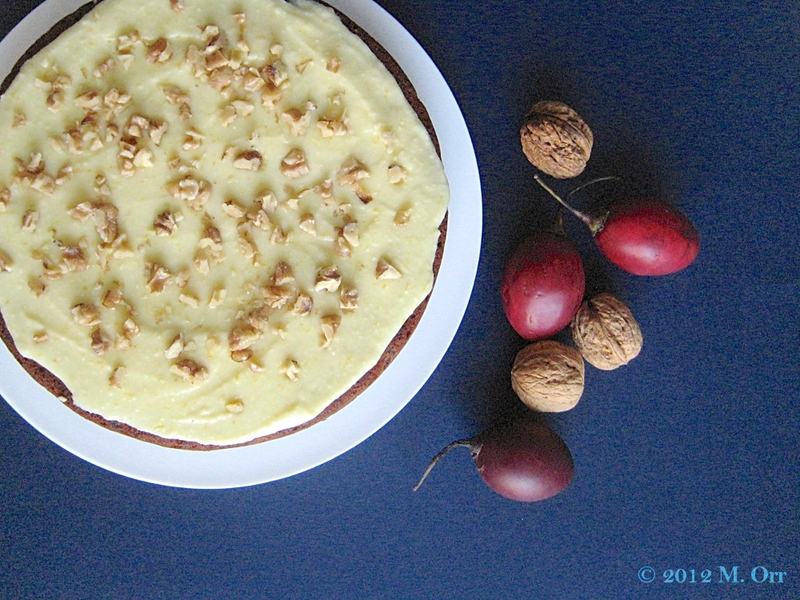 When I was browsing through them to figure out what to do with my tamarillo impulse buy from the farmers’ market, a recipe for tamarillo and walnut cake jumped out at me. 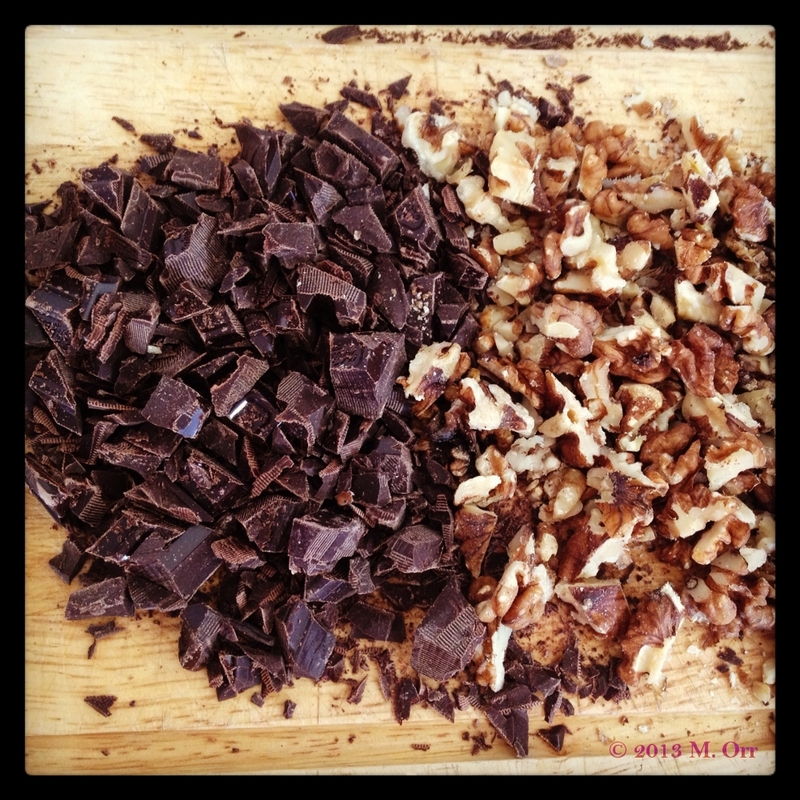 I freaking love walnuts so I was all over this recipe. The only problem: it was a fairly brief recipe. 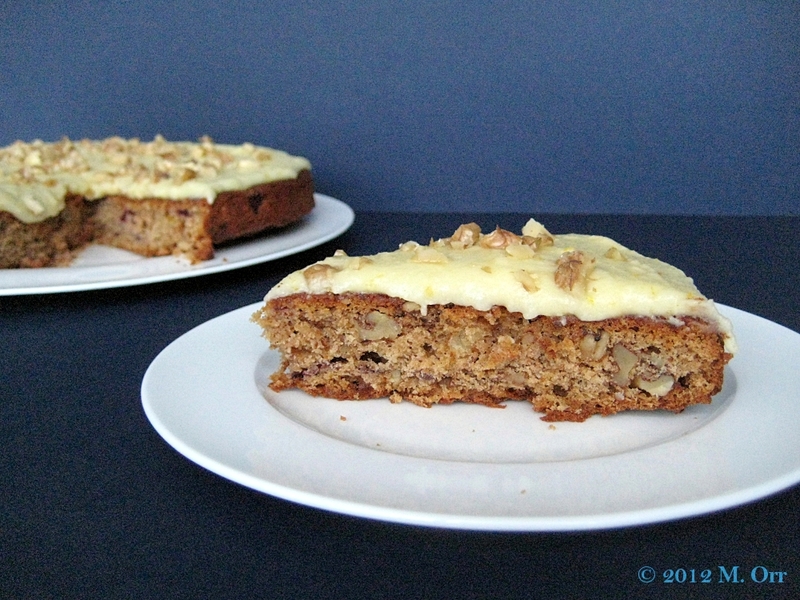 The ingredients listed ‘cooked tamarillos’ which didn’t help me much with my fresh tamarillos, but after consulting the internet and a little successful experimentation, I ended it up with cooked tamarillos, which then turned themselves into a rather scrumptious tamarillo and walnut cake. The not-overly-informative recipe also failed to specify the size of cake tin to use. Just a minor detail. I clearly picked one that was a little too large so the cake ended up a little thinner than I’d have liked, but that’s really just a pernickety presentation issue and luckily doesn’t affect the taste. Based on their bitterness, I wasn’t too sure how tamarillos would work out in baked goods, but actually the tamarillo flavour wasn’t quite as strong as I was expecting, and there’s no trace of bitterness whatsoever. I love that the walnutty taste comes through really well, and is well balanced by the lemon icing. 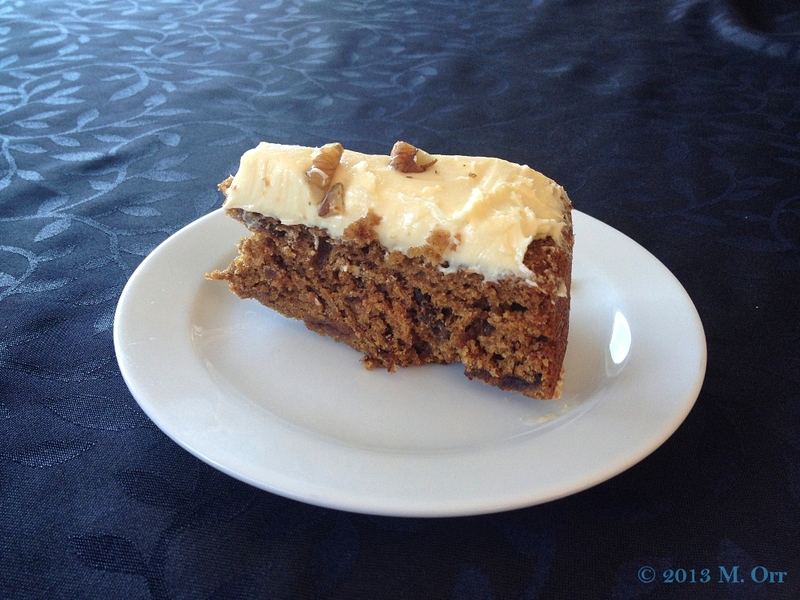 Basically, I really enjoyed this cake (and so did the lab, my trustee taste-testers) and if you happen across some tamarillos and are unsure what to do with them, give this a go! I’m also submitting this cake to this month’s AlphaBakes challenge which is being hosted by Ros at The More Than Occasional Baker. This month’s random letter is “T” like tamarillo, which is a rather marvellous coincidence since I actually bought the tamarillos before reading the challenge. Once the tamarillos have been cooked, do taste one to check that they aren’t too bitter. If they are, drain them. sprinkle with a little sugar and sit for ten mins or so before using. I used a 24cm cake tin but the came out much thinner than I would have liked, so I’d suggest using a 20cm cake tin, or even an 18cm one to get a thicker cake. If using a 24cm cake tin as I did, do watch that it doesn’t over-bake. The icing is optional, but adds a delicious touch. You could also use a simple lemon drizzle icing if you prefer. 1. 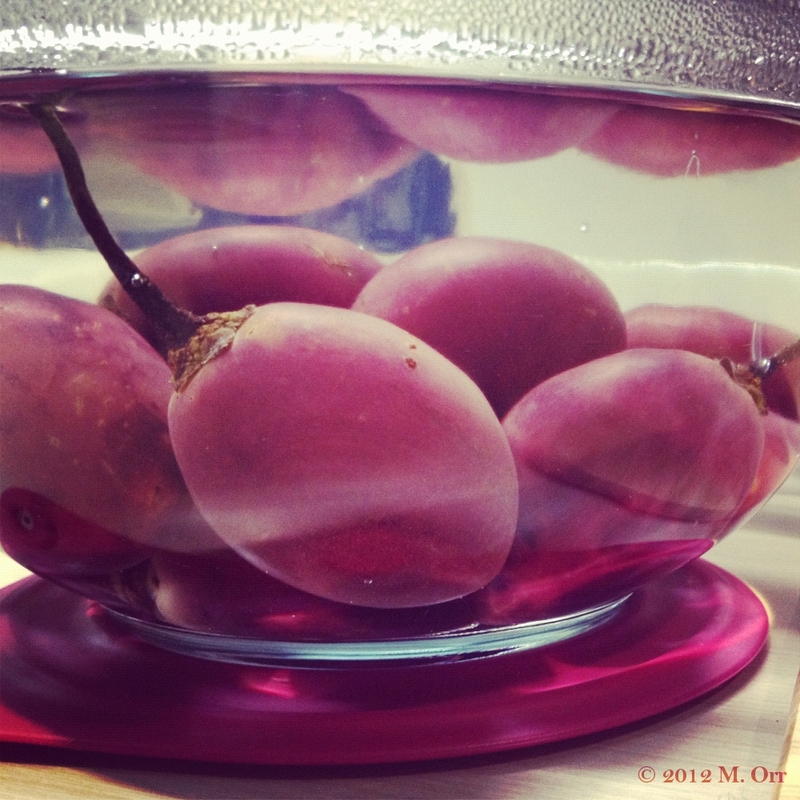 Place the tamarillos in a heat-proof bowl and pour boiling water over them. Allow to sit for 2-3 mins, then skin them, starting by lopping off the stalk with a sharp knife and peeling off the rest of the skin (the skin peels away very easily once started). Slice the skinned tamarillos and place in a medium-sized saucepan with the sugar and lemon juice. Add enough water to barely cover the fruit, cover the saucepan and gently simmer until the fruit is soft (this took about 15 mins for me). 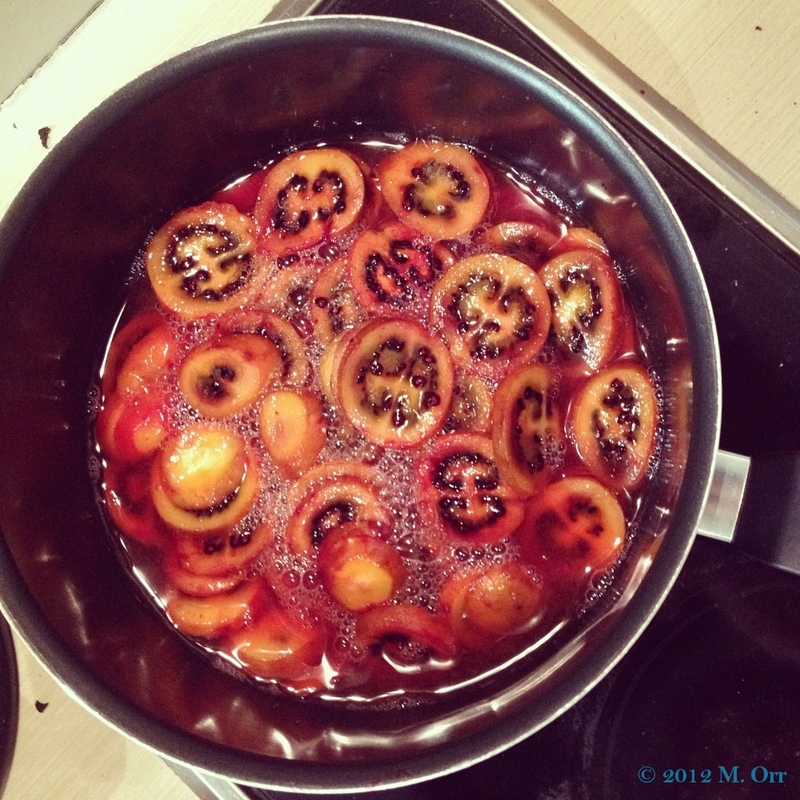 Remove the cooked tamarillo slices and drain them well before chopping up (you should have about 190g cooked tamarillos). Set aside. 2. Butter a 20cm round cake tin. Pre-heat the oven to 180°C/fan oven 160°C. 3. 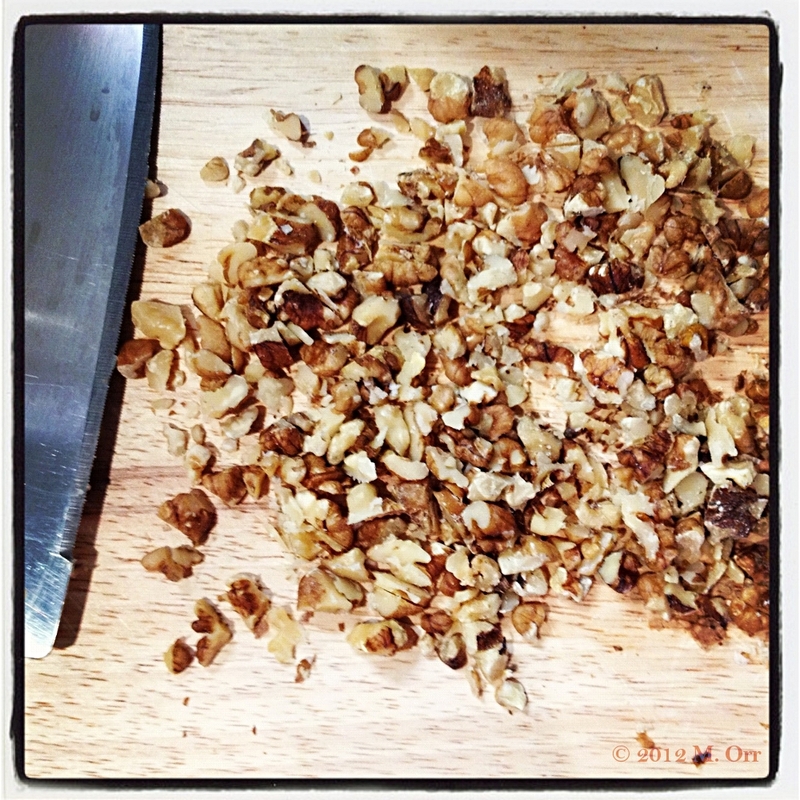 Roughly chop all of the walnuts and toast them in a frying pan over low heat until fragrant. Toss frequently and be careful that they don’t burn. Set aside to cool. 4. Sift the flour, baking powder and spices into a medium-sized bowl. In a small bowl, lightly beat the eggs with a fork. In a large bowl, cream the butter and sugar together until fluffy. Whisk in the eggs until well incorporated. 5. Alternate between stirring in some of the flour mixture and some of the chopped tamarillos. Then stir in the peel and 50g of the chopped toasted walnuts. 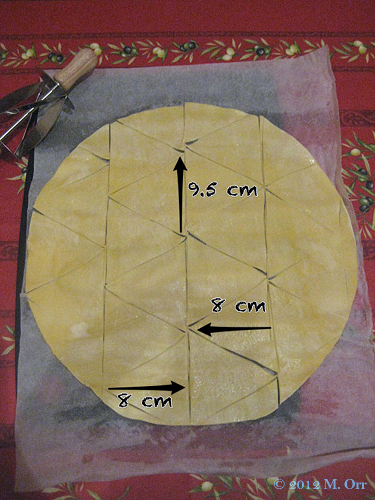 Pour into the prepared cake tin and bake for 1-1¼ h, until a toothpick inserted in the middle comes out clean (if using a 24cm cake tin like I did, start checking after 45 mins). Leave the cake in the tin for 15 mins before turning out onto a wire rack to cool completely. 6. Once the cake is cool, make the icing. Beat together the butter and icing sugar. Once well incorporated, whisk in the zest and juice of the lemon. Mix in the cream to reach the desired consistency. Pour icing over the fully cooled cake, smooth if necessary using a palette knife or spatula and top with the remaining toasted chopped walnuts. The Olympics are over… now what? 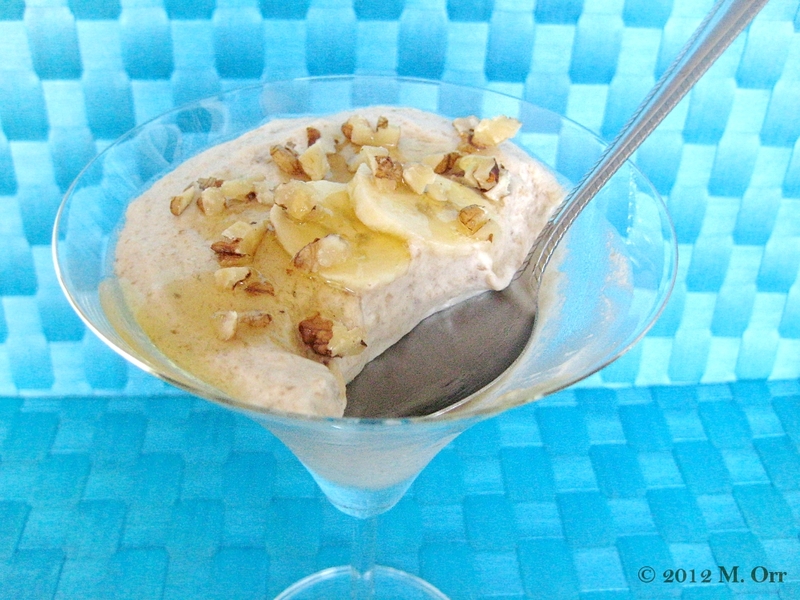 Banana mousse, that’s what. So. The Olympics are over and normal life has resumed. Does anybody else feel like there’s a gaping hole in the shape of fiver inter-linked rings in their lives now? At least it’s only for a couple of weeks until the Paralympics start (hurry up already! ), but in the mean time, comfort food is clearly the order of the day. What’s that? The point of the games was to inspire everybody to go be sporty and all? Well that’s all good, but people still have to eat, so comfort food wins out for today. 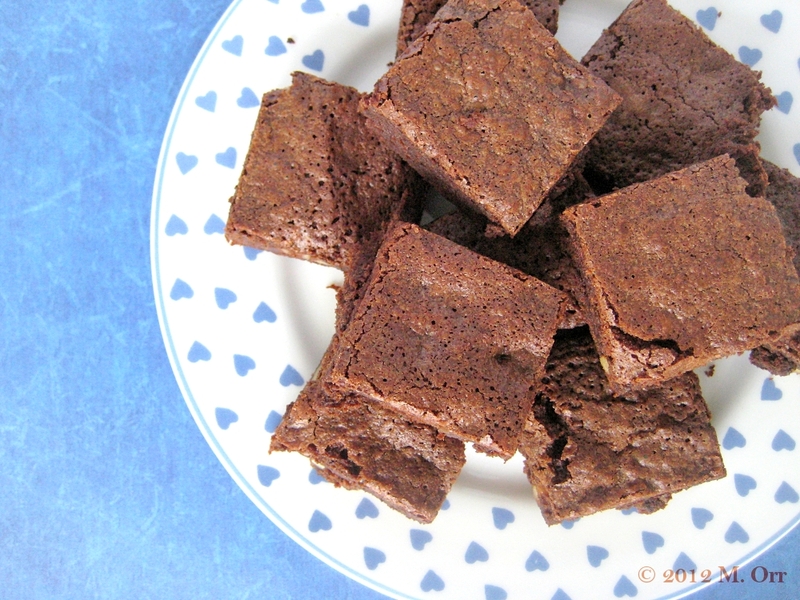 I’ve got the perfect comfort dessert for you – not only is it delicious, but it’s also exceptionally easy and quick to prepare… Fast food with no McDonald’s in sight. After last month’s excuse for a nosy snoop around other bloggers’ bookshelves, we’re going “back to the very beginning” for this month’s Random Recipes, meaning back to the original rules of randomly picking a book, then randomly picking a recipe from said book. Simple. I used the random number button on my calculator as usual, which directed me to book number five, which turned out to be Cuisine Express, a convenient choice since the recipes are all fairly quick to prepare, though a fair few of the shortcut ingredients aren’t very easy to find outside of France (and are usually expensive if you do), which isn’t ideal. I needn’t have worried though, since the random number button directed me to page 146, giving me a choice of several different quick fruit mousse recipes. 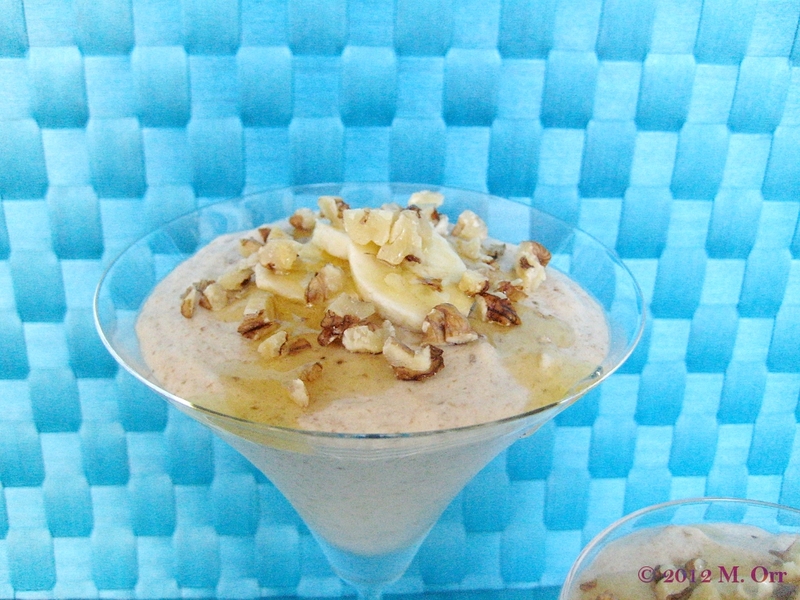 As delicious and tempting as the raspberry or peach mousses sounded, it’s very much not raspberry nor peach season here, so I chose the banana express mousse. It definitely lives up to its name as it only takes ten minutes to prepare, although it does require at least two hours of chilling in the fridge before serving. But actually that’s great because it’s a dessert that can be prepared in advance or even the night before, which is always helpful. 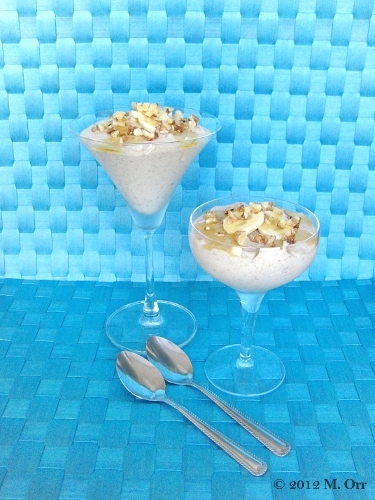 The mousse itself is lovely and creamy and smooth, and the banana flavour comes through strongly, which is great. I added some honey on a whim since I’ve got a bit of a sore throat so I’m adding honey to things left, right and centre at the moment and that was a delicious little added extra, as were the banana slices and toasted walnuts. They’re all optional extras, but they can take this from an everyday dessert to one presentable enough to finish up a dinner party without much extra effort (always a bonus!). Serving it in martini glasses or champagne coupes also automatically makes it look fancier. Here’s to speedy comfort food! Although very quick to prepare, don’t forget to plan for the 2h of refrigeration. The mousse can be refrigerated for longer, even overnight if necessary – the lemon juice keeps the banana from going all brown. This can work as a fancy dessert served in martini glasses, champagne coupes or other fancy glassware, or an everyday dessert served in little ramekins or bowls. The decorations on top are totally optional, but do add a little bit of pizzazz to the presentation. Whilst brown sugar would go really well with the bananas, I decided to stick with white sugar as I’m not sure that using brown would result in the most presentable of colours. 1. Peel four of the bananas (keep the fifth one unpeeled until needed) and pop them in a blender along with the juice of the lemon and the caster sugar. Whizz together until totally smooth. 2. In a large bowl, whip the cream. As it begins to firm up, add the icing sugar and continue whisking until firm. Gently add the banana mixture to the whipped cream and carefully fold together. Split equally between four martini glasses/champagne coupes/ramekins/bowls. 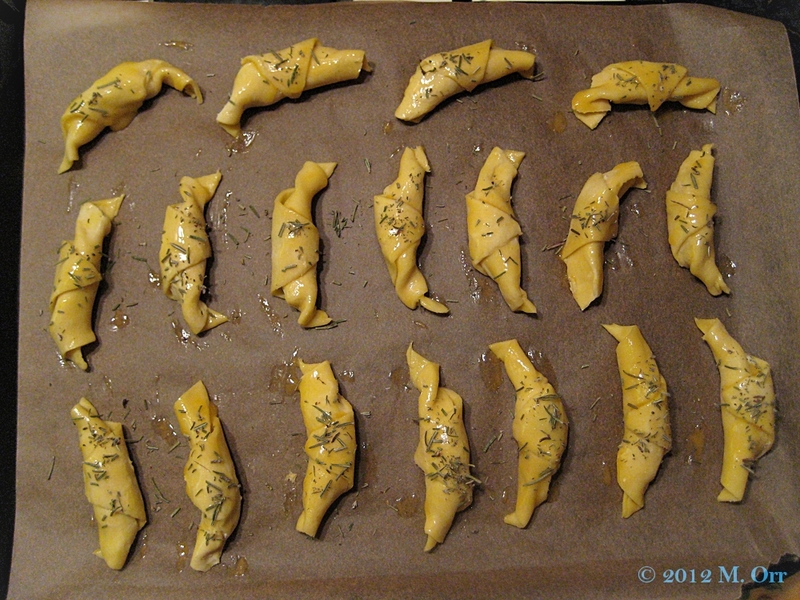 Refrigerate for at least 2h. 3. Whilst the mousse is chilling, roughly chop the walnuts and toast in a frying pan over a low heat until fragrant. Allow to cool and set aside until needed. 4. To serve, peel and slice the last banana, lay three slices of banana in the middle of each individual mousse, and top with the toasted walnuts and a drizzle of honey. Serve immediately. It’s December now, which means one thing… Well, two things. Firstly, uhm, how is it already the last month of 2011?! Seriously, when did that happen? Let’s ignore it and move on swiftly (and with style) to the next thing: December means getting all festive!! Now, leading up to December, I am a complete and utter scrooge and I detest everything to do with Christmas. In any month other than December, I could probably give Scrooge a run for his money. Possibly even Scrooge and the Grinch combined. Then, as soon as it’s December, you could flick a switch and suddenly I get all enthusiastic about it. Well, about the festive spirit. Not the overly-commercialised you-must-buy-as-many-hideous-and-useless-presents-as-possible aspect to it (which is a rant for another day. I’m sure you’re looking forward to it already…). But let’s all give a huzzah for the festive spirit! And for mulled wine! (Although that’s acceptable from Bonfire Night. Or as soon as it starts getting cold really.) 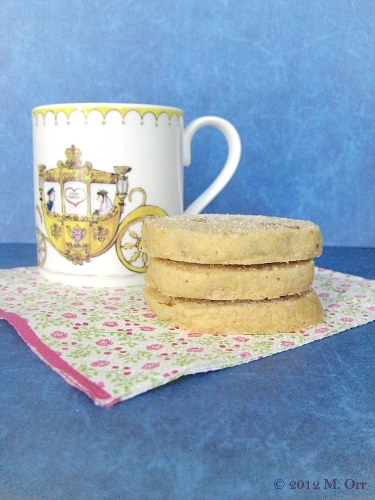 And mince pies – I love mince pies! I should probably add the caveat that if you really detest blue cheese, these probably aren’t the muffins for you, but if you’re a bit on the fence about blue cheese, maybe give them a try – the Stilton really doesn’t come through as much as you might expect so it really doesn’t over-power the muffin, and the sweetness of the dates combined with the subtle pear flavour counter-balance it really well. Even though they’ve got both sweet and savoury elements, I’ve categorised these muffins as savoury because they work really well as a light lunch or snack. They could possibly even work as an informal alternative to a cheese board. However you decide to eat them, they’re definitely deliciously seasonal! Here’s to getting into the festive spirit! The pear is quite a subtle flavour, so I made sure not to mash it up completely so that there were still a few chunks to give little explosions of flavour. I used Stilton, but I’m sure that most blue cheeses would work. The Stilton doesn’t come through as much as you might expect it to, so don’t worry if you’re not too keen on blue cheese. As with most muffins, these won’t keep all that long, but they will store well in an air-tight container for a couple of days. 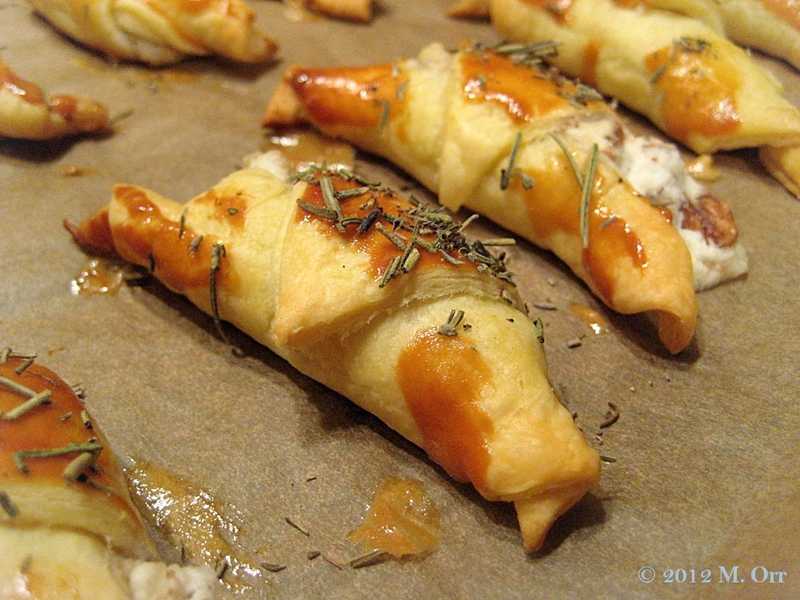 These are delicious both warm out of the oven or fully cooled. 1. Pre-heat the oven to 200°C/fan oven 180°C. 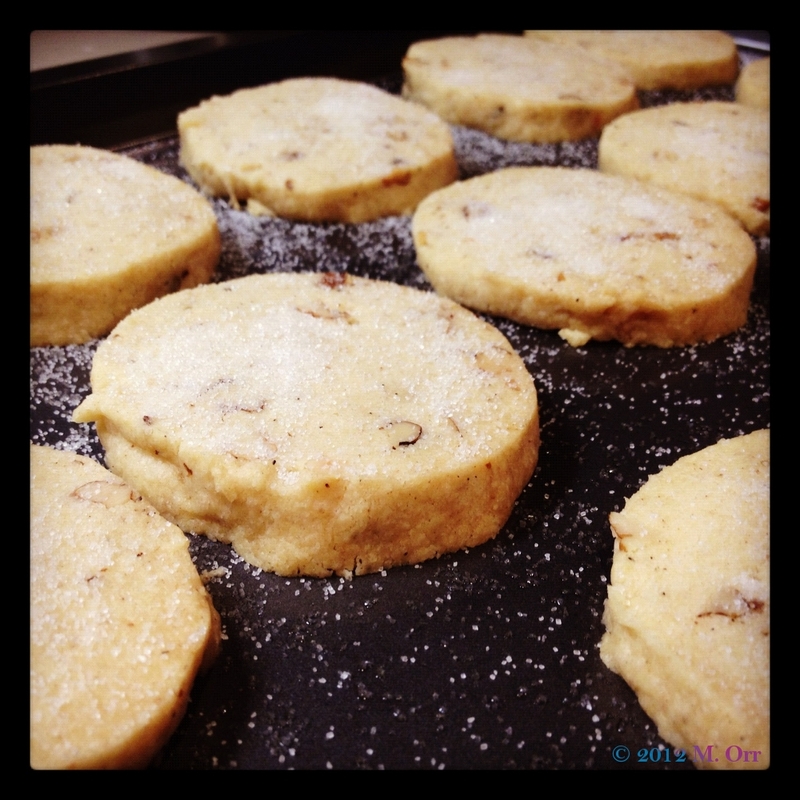 Butter or line 13 muffins pan sections or set out 13 silicon muffin moulds on a baking sheet. 2. Roughly chop the walnut halves. 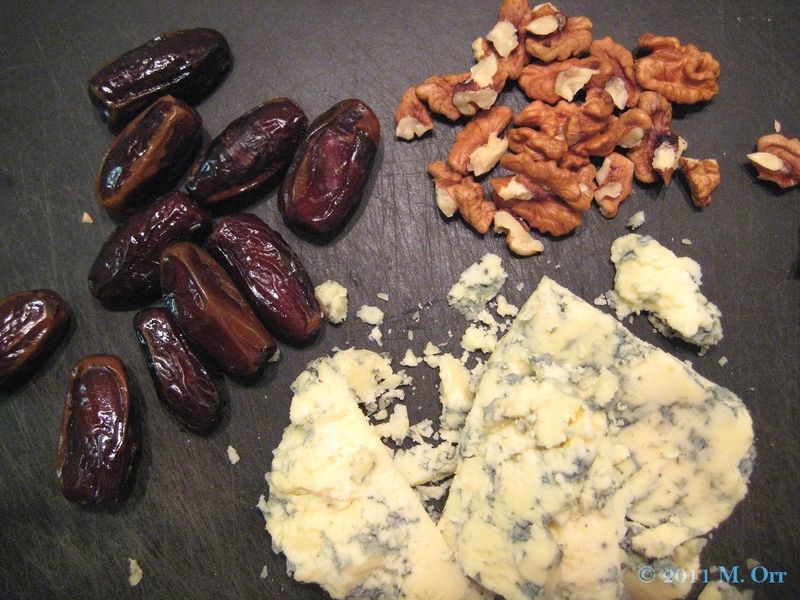 Chop the dates and crumble the Stilton (don’t crumble it too finely – little chunks are good). Set aside. 3. Sift the flour, sugar, baking powder and salt into a large mixing bowl and mix together. 4. Peel and core the pear and add to a clean bowl. Mash roughly with a potato masher (make sure there are still some little rough chunks left). Add the oil and eggs and gently beat together with a fork. 5. Fold the pear mixture into the dry ingredients with a large metal spoon, until just combined (it’s fine if there’s still a little bit of flour visible). 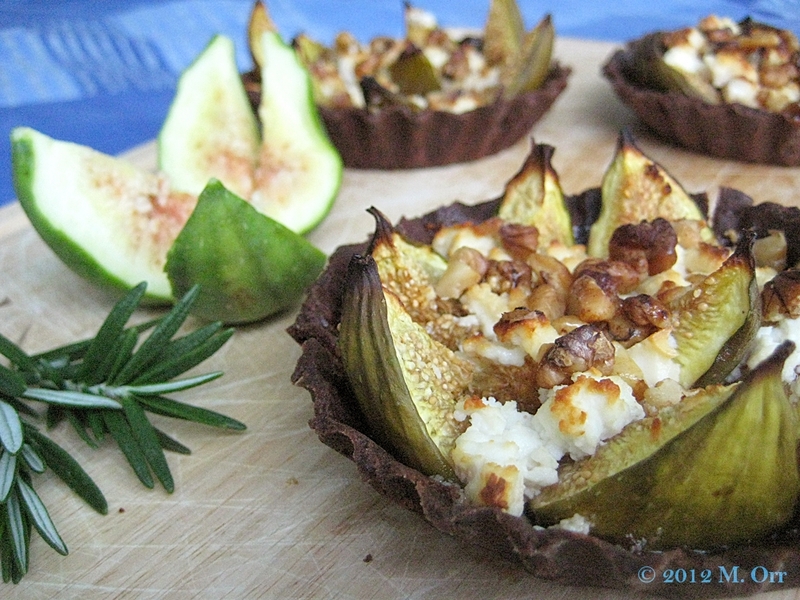 Carefully fold the dates, Stilton and half of the walnuts into the mixture before spooning into the prepared muffin pans or moulds. 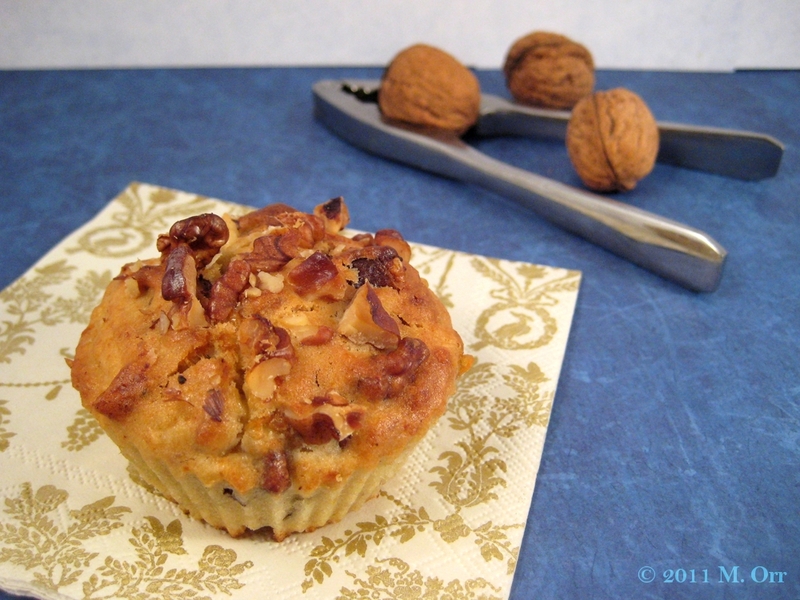 Sprinkle the remaining walnuts evenly over the tops of the muffins. 6. Bake for 22-25 mins, until the muffins are golden and well risen. The tops should spring back when lightly prodded. Transfer to a wire rack to cool a little before eating.